You get into a car and try to use the on-board navigation system to plot your upcoming course. Unfortunately, something glitches out during your route, and you’re totally lost. Instead of pulling over, you decide to fiddle with the system in between lights and while you’re driving. You get lost between functions and struggle to find the right menu item to hit. And then you wind up rear-ending another car. This scenario is completely realistic. While most distracted driving statistics focus on cell phone use while behind the wheel, your car’s built in computer can also steal your attention from the road just long enough to cause accidents, or even worse, lead to fatalities. Vehicle sharing companies like Car2Go will even warn customers against using the on-board computing system while in motion, because this behavior is an extreme hazard. Fortunately, there are some smart car companies that are easing up on the distractions, and attempting to get drivers’ eyes back on the road. The current dialog regarding distracted driving has focused on mainly on cell phone use, especially texting related accidents involving young or new drivers. And during April, which is Distracted Driving Awareness Month, many news outlets published statistics on cell phone use amongst drivers. However, the problem isn’t just our mobile devices – it’s also the smart technologies that are built into our vehicles. Researchers at the MIT AgeLab discovered that navigation entry using voice commands actually take our eyes off the road for a whopping 32.8 seconds. This discovery was particularly startling, since many drivers and car companies associate voice commands with safer driving. It has been presumed that voice inputs prevent accidents because drivers shouldn’t have to look at and touch a screen to use the navigation system. Unfortunately, the MIT experiment shows that verbal inputs might be just as distracting. They theorize that memorizing and executing verbal commands might place enough cognitive load on a person that they’re unable to focus on driving. In an effort to get a better grasp on distracted driving, Toyota and Microsoft have been thinking outside of the box. They recently unveiled the Driver Awareness Research Vehicle (DARV), which will actually keep your children occupied with entertaining games while you operate a vehicle. Parents who have struggled with noisy children fighting in the backseat can let out a sign of relief. This car has parents’ best interests in mind, keeping child-related distractions to a minimum with interesting on-screen games. Lists are another popular design element in distraction-conscious car companies. Features that have large print arranged in a list fashion can be much easier for drivers to read and navigate. This data presentation can make it easier for drivers to return their gaze to the road. While researchers and the media continue to examine mobile devices as a source of distracted driving, it looks like insurance companies are turning an anxious eye at smart cars. AAA released a study emphasizing the risk of on-board computer systems and hands free technology. They indicate that it doesn’t really matter if your eyes and hands are engaged in driving, because your mind can still be distracted. This hearkens back to the MIT idea of cognitive load causing distraction. AAA explains that driving while using hands free technologies can give you a tunnel vision effect, reducing the amount of visual information that you’re able to process at one time. With auto insurance companies scrutinizing smart car technologies, it begs questions like: Will our premiums go up if we own smart cars in the future? Will there be greater incentive to purchase cars without minimal on-board systems? Distracted driving is a multifaceted issue, one that policymakers, car companies, software developers, and insurance companies are grappling with. The social and tech phenomenon of distracted driving is a relatively young issue, but there seems to be little indication that tech use while driving will ease up. Drivers can stay safe by keeping on-board navigation to a minimum while driving, or by pulling over to a complete stop before examining data and inputting a destination. 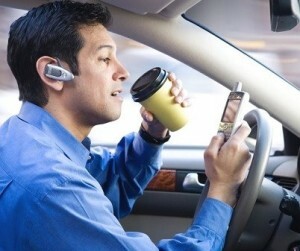 It’ll be interesting to see what innovations car and tech companies come up with during the battle against distraction.